Depression and anxiety are conditions that can develop during menopause. They can emerge at different times or build up simultaneously, often leaving women overwhelmed and exhausted. Fortunately, there are a number of natural approaches for relieving these menopausal symptoms and preventing their negative effects. These treatment strategies are primarily aimed at improving overall health through lifestyle changes that can lead to improved hormonal balance and reduced symptoms. When fighting anxiety, it's important to eat a balanced diet of whole grains, fruit, vegetables, and lean protein like tofu. The most important vitamins to overcome anxiety and depression are B vitamins, vitamin D, and vitamin C. Get a blood test to make sure you don't have a nutrient deficiency. If you do, it's important to take a supplement or increase your intake through diet. To boost your mood, it's important to get adequate physical activity. Overcoming negative feelings is even more difficult if you have a sedentary lifestyle. Around 3 hours of exercise per week is essential for mental and emotional health. Cardiovascular activity will help raise serotonin, endorphin, and oxytocin levels, all hormones that encourage happiness and tranquility. Try swimming, dancing, or taking brisk walks through the park. For deep relaxation through an increase in the neurotransmitter gamma-aminobutyric acid (GABA), try a profoundly balancing yoga session. The series of postures involved in yoga practice help you focus on your breath and your body rather than upsetting thoughts and feelings. Herbal remedies have proven very useful for overcoming anxiety. Whether you feel stressed or depressed, there is a medicinal herb for it that has been tried, tested, and cherished for hundreds or even thousands of years. For depression, try St. John's wort or ginkgo. For anxiety, try valerian, passionflower, or chamomile. Make sure your teas or supplements are pure, high quality, and from a trusted source. Several studies have shown the soothing benefits of meditation. Meditating can help you to tame anxious thoughts, relax your body, and work through personal problems. It can be difficult at first, but if you practice daily, you'll see an improvement in coping abilities over just a few weeks. It can be helpful in the beginning to join a meditation group or receive guidance from someone with plenty of experience. It can be extremely beneficial to discuss your worries and emotions with a counselor or therapist. Your counselor will listen to whatever you have to say with an open mind. He or she will work closely with you to help you overcome anxiety, depression, and any other problems you may have. A counselor can be a great source of support. Though it can be difficult and seem impossible sometimes, try not to let depression and anxiety discourage you. Remember, there is always a way out. The above lifestyle adjustments may require a bit of dedication and commitment at first, but they can deeply improve your quality of life. Trying these natural approaches will help you work toward a healthier, happier life, free of depression, and anxiety. 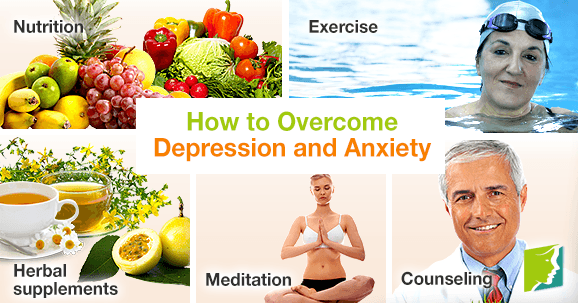 For more information about causes and treatments of depression, follow the links below. This article goes into more detail about the types of behaviors that have been known to trigger depression in some women. Depression can be a serious medical condition that impacts people of all ages, including menopausal women. Fatigue is often a symptom of depression.